Discussions about climate change usually center around global temperatures and the general state of the environment. The relevance to a local audience isn’t always apparent. A person in Arizona, for example, will not worry about melting ice caps any more than a Chicagoan will be concerned about extensive flooding in the Gulf states. A good way to engage readers in the climate change debate is by showing them how it might affect them in the near future. If you cover a region with a strong agricultural base, here are four areas to investigate as you look at climate change. Higher CO2 levels and other greenhouse gases result in higher average temperatures, affecting not only the food that we eat, but also what livestock eats. The intense concentrations impair the quality of feed crops produced for animals, which can translate into the quality of meat on our plates. Additionally, long-term droughts can leave animals with limited water reserves. In Arizona, for example, the production of cattle and dairy, the state’s leading agriculture products, could possibly hit a limit as less water is available. Farmers will have to explore other feed production methods that require less water. Climate change affects agriculture, but agriculture also impacts climate change. According to the USDA in 2014, agriculture contributed to 10 percent of greenhouse gas emissions in the United States. The emissions are a result of increased CO2 from deforestation and methane from cows. 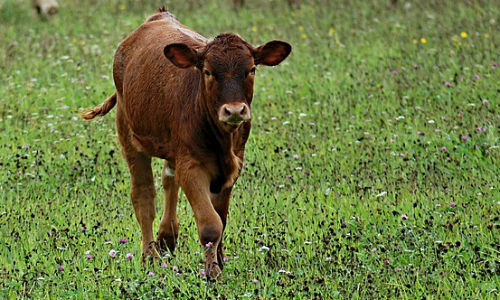 A state like Arizona will need to find more environmentally friendly ways to raise livestock. Heat stress is the second largest cause of decreased dairy and beef production. According to the journal Climate Risk Management, “The quantity and quality of feed will be affected mainly due to an increase in atmospheric CO2 levels and temperature.” All animals have a thermal comfort zone. Heat stress can have multiple negative effects on cattle, including respiratory diseases that can lead to death. In Arizona, the issue is particularly important since the state’s average temperature has increased by about 2 degrees in the last century. Rising temperatures impact crops as well as livestock. Climate change CO2 levels, temperatures and solar radiation have impacts on crops. “Each crop species has a given set of temperature thresholds that define upper and lower boundaries for growth and reproduction.” As temperatures increase, certain areas where crops are grown will not meet these temperature thresholds. Local farmers are at risk for low crop yields or entire crop failure. Long stretches of heat in parts of Arizona, for example, can threaten the overall growth of crops. Arizona is the nation’s second largest producer of lemons. The ideal temperature threshold for growing lemons is between 77 and 86 degrees, with a maximum of 104 degrees. After that, growth stops almost completely.